Boys rooms can be a hard place to decorate. They love there stuff, but you never know what thing they will be into next month. I remember my brother being into so many things growing up...Teenage Mutant Ninja Turtles, Transformers, sports, jets, and of course cars. I think cars are pretty standard for boys. Anything that is fast, and looks cool. They may not ever drive those cars they dream about....but you can help them dream! 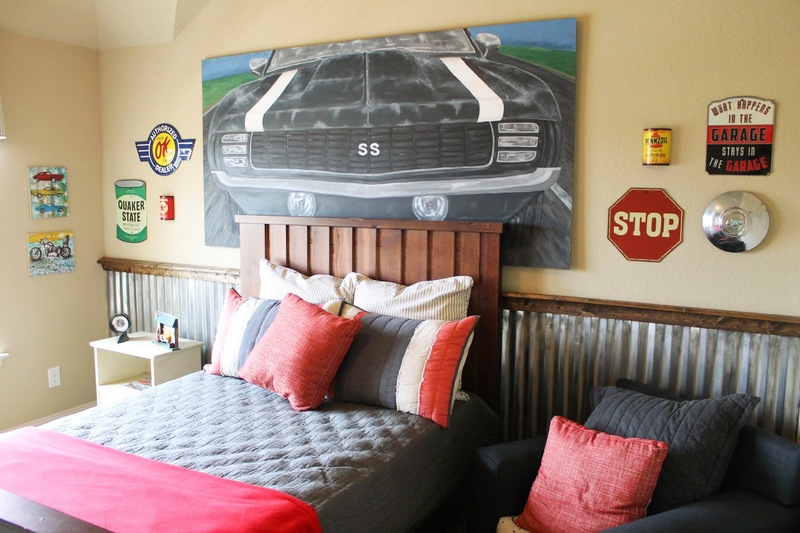 A car themed room, is always fun, and easier to make than you think. 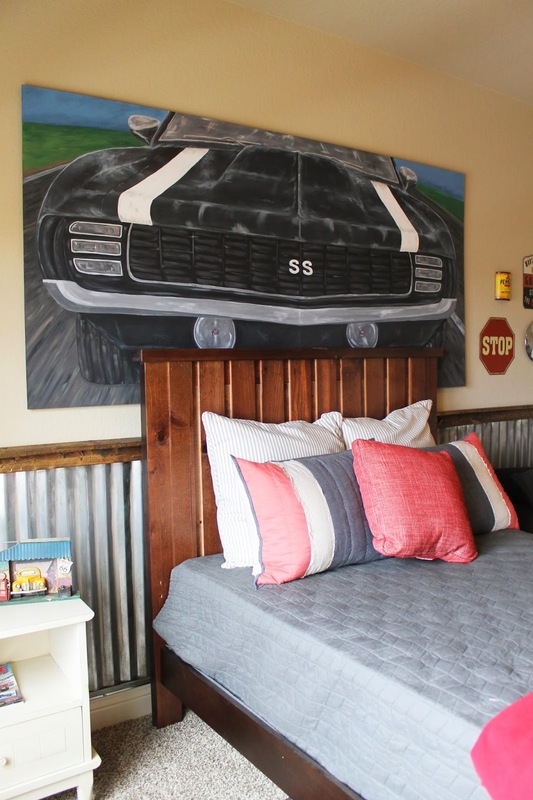 Replicas of vintage metals signs are pretty easy to come by, and mixed with some vintage pieces, good textures, and awesome art, you can make a space that doesn't look cheesy...and will last for years. 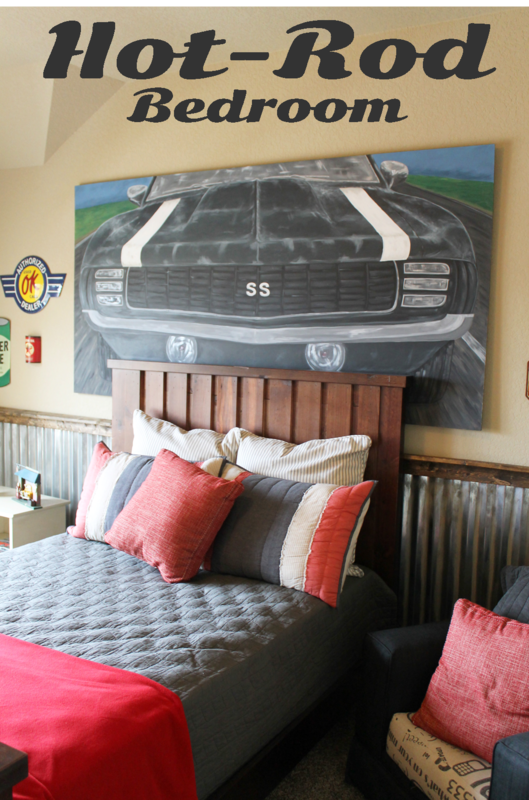 Here is a hot rod bedroom that I worked on with the amazing gals at Dy Lynne Decor. To start, they used a neutral, light tan base paint, then the metal wall treatment was installed. 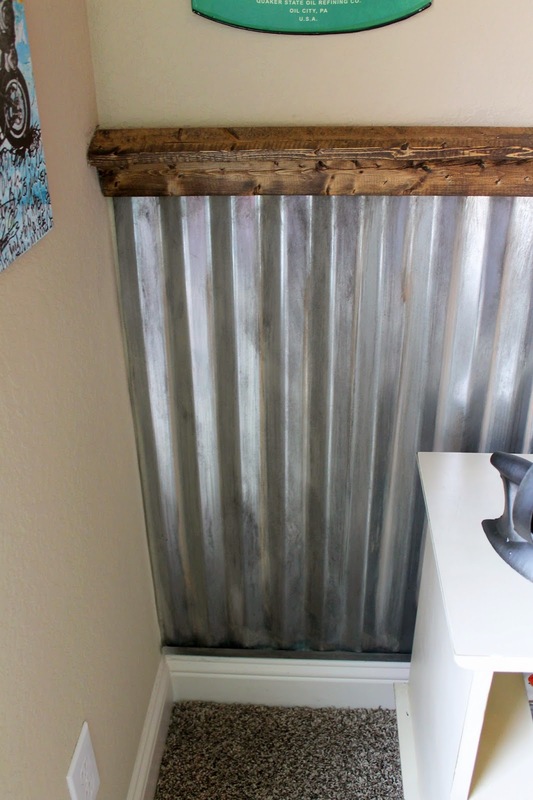 A wide corrugated metal panel was used, the full length of the back wall, about as high as a chair rail. This stuff is very sharp! The handyman had the battle wounds to prove it. So the top, and bottom need to be capped off. The depth of this sheet is over an inch, so it will stick out over the base board, and has to be capped off. Here, they used a cap that you can find near the corrugated sheets, this is what it is made for. It acts as a tray, that the sheet is inserted into. For the top cap, they installed two pieces of wood trim. Nothing fancy, just a piece of pine against, the wall, and one laying on top, acting a shelf. I stained this in a walnut color. 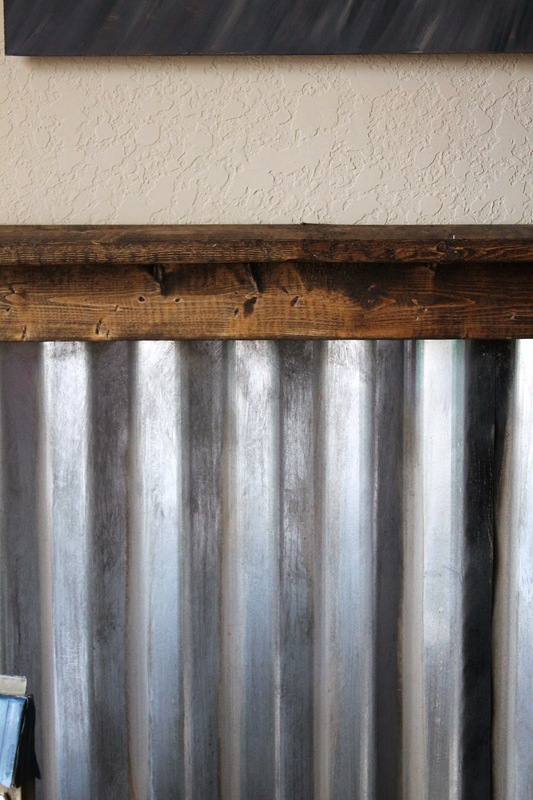 To give the metal an aged look, I used a deep brown, latex paint....brushed a little bit on, and wiped it back off. Just leaving a hint of color. A dry brush can soften any heavy areas. 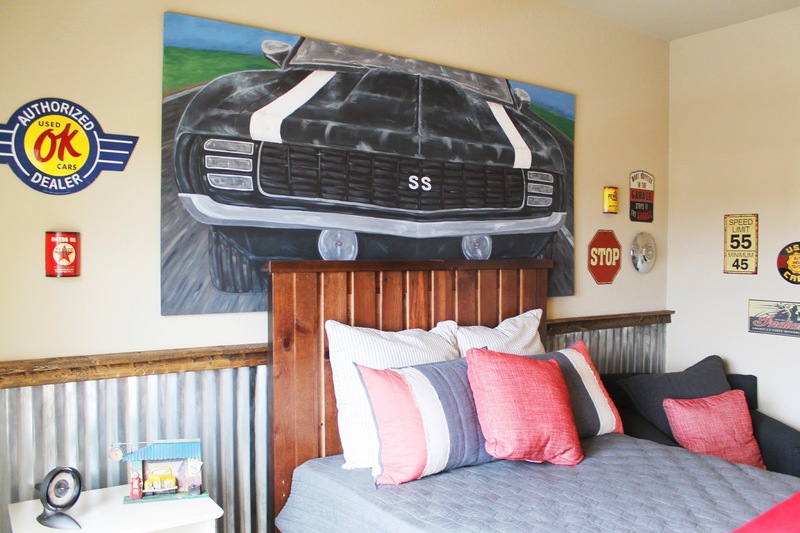 The key to the room, of course, was the giant Camaro painting I made. Dy Lynne gave me the specifics, as far as color, and type of car...and said she wanted it coming straight at you. Now, for all you car buffs out there, I know it isn't quite anatomically correct, but we wanted to have certain details. So I mixed a couple different years of cars on this one.... don't tell Chevy! It was painted on a thin wood sheet. Three 1"x2"s were mounted to studs on the wall, and the painting was screwed to that. 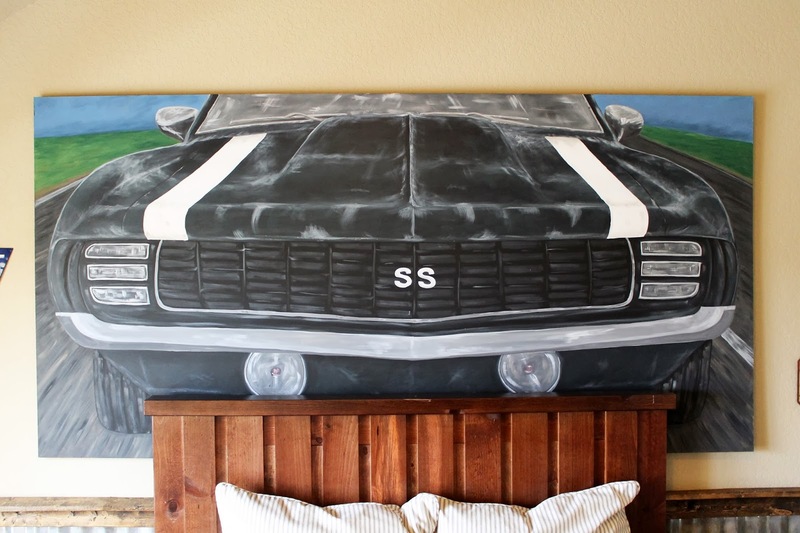 You can't help but dream about cars with this above your bed. 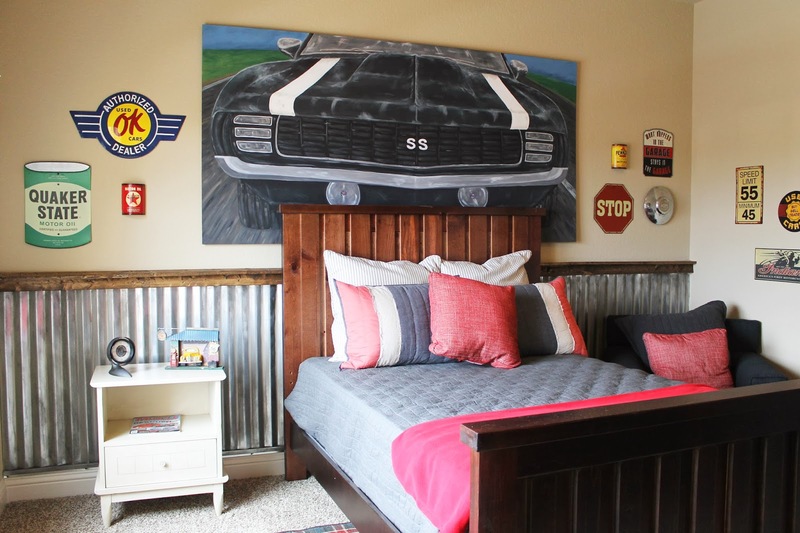 You could use any kind of car related painting here, or an old metal sign, vintage poster replicas, or even a photo blown up. There are lots of companies out there, where you can have a photo blown up, and made into a canvas print. If a family member had a car that meant alot, or was just cool looking, this would be the perfect spot to pay them homage. As far as rest of the decor goes, they mixed the textures and materials. 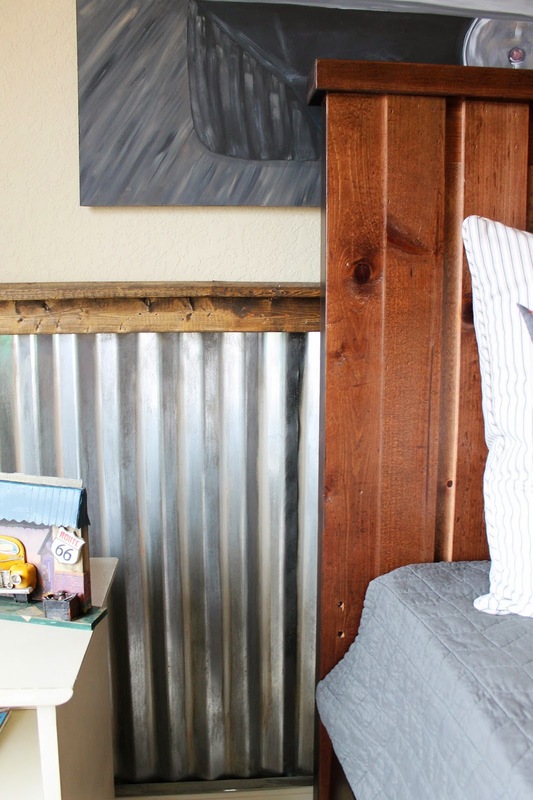 You want materials like linen, canvas, or quilted fabircs. Fabrics with texture, bringing in solids, so not to detract from the focal points in the room. Mixing the types of art work, and materials. 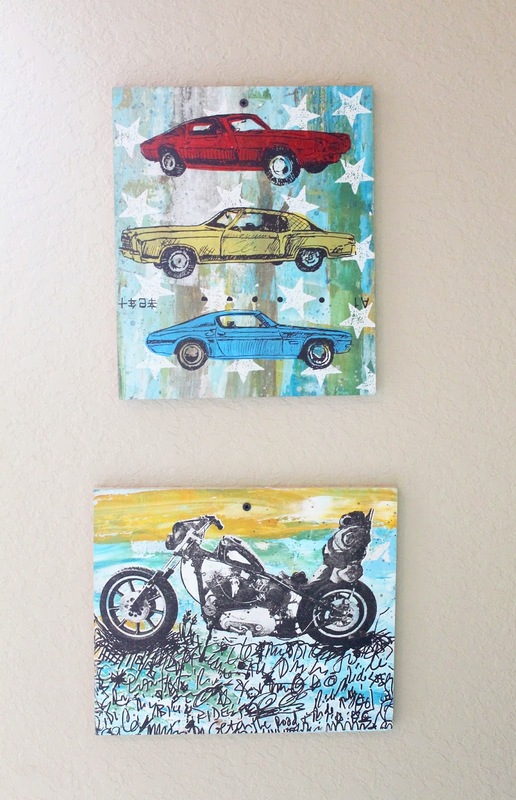 Metal signs, wood pieces, and canvas art. You don't want it all to match. It should look found, and collected. There really isn't alot going on in the room besides the art here. This keeps it simple, and vintage looking. 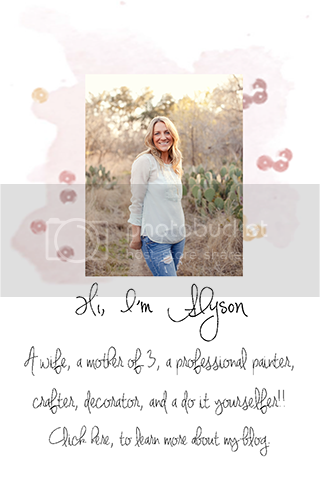 Check out Dy Lynne, and her awesome team, from Dy Lynne Decor on Facebook, or at dylynnedecor.com, for more inspiration! Or at the top of the page, under the Model Homes tab, for some of our previous work.